Raising a family, especially one with several children, can be expensive. Fortunately, there are some ways parents can save money on stuff for their kids. It will take a little extra planning, but it can be done! Kids grow quickly. The result is some very gently-used clothing that can be passed down to younger (or smaller) siblings. Keep the jeans that don’t have holes in them, and the t-shirts that are still in good shape. Winter coats tend to be expensive, so find out if your child can wear theirs again this winter. If not, perhaps it will fit a younger sibling. Back-to-School shopping and seasonal shopping does not have to be done at a retail store. 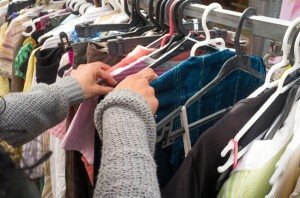 Thrift stores have very inexpensive clothing, for both children and adults. Keep in mind that the size on the clothes may no longer reflect the actual size that it is now. Always check over each piece of clothing very carefully. Look for stains and holes. Does the item look new, or is it very worn out? If possible, have your kids try on the clothing before you leave the thrift store. Or, ask a worker what their return policy is. Pay attention to the sales papers and the websites or social media of your favorite stores. Doing so is the easiest way to find out when their clearance sale on kids clothing starts. The clearance sale is a great opportunity to buy brand new clothing for a discount off the original price. Retail stores often have changing rooms where your kids can try on the clothing to make sure it fits. In addition, retail stores will have clearance sales on toys. There are certain times of the year when that happens, and it is usually advertised. It might be possible to combine clearance sale items with membership discounts or coupons. It is possible to find a lot of children’s clothing at garage sales. There are two things to keep in mind before you shop. One, garage sales require people to pay in cash. Two, garage sales don’t have return policies. Take your best guess about whether or not a piece of clothing will fit your child. Garage sales are also a good place to get children’s books and toys. Check the toys carefully to make sure they work, have all the pieces, and whether or not they require batteries.